Nautical by Nature: Marley Lilly Monogrammed Floppy Hat Giveaway! The winner of this giveaway will receive a MONOGRAMMED floppy hat from Marley Lilly! This hat is perfect for any occasion (wear it to the beach, wear it to the Kentucky Derby, Easter Sunday, shopping, inside, outside WHEREVER!). See it on one of my favorite bloggers, The College Prepster, HERE. The hat is available in 6 color trim options: pink, lime, brick, black, turquoise, and orange. The winner can also choose the thread color (for the monogram). LOVE these hats! Such a great price too! I just saw this on College Prep and was thinking I wanted to order one for a Derby party. My favorite product is the croakies. I also really like the pink derby hat. Crossing my fingers on this one, thanks!! I've always loved the monogrammed scarves by Marley Lilly! I think they are my favorite, next to this fab hat for the beach! I follow Marley Lilly on Facebook! I just saw that they are coming out with monogrammed polos -- yay! Love love love the hat!! I want more than one! SO cute! I'm a fan on facebook too. Love the hat, and I follow Marley Lilly on Facebook!" My favorite product is definitely the hats, but I also like the monogrammed pashminas! Hope I win--this would be perfect for our Florida Keys Honeymoon, coming up in 2 weeks!! My fav thing on the Marley Lilly website? Definitely the monogrammed koozies. If you're going to have your beer, have it in style! Love the hats but also like the rope sterling silver engraved ring and the collapsible market bag too. Have a great day, kate! Following on FB too!! How can I not?? Since warm weather is on the brain, I hit the summer tab immediately! I am in love with the lounge chair covers. I do believe that I will be ordering them for my All Girls Beach trip in June! Of course, I shall need that hat to go along with it dollface! L~O~V~E it. . . .
My favorite products are the monogrammed hat and the sterling silver monogrammed ring! What a fun website! I have blogged about this giveaway! Here's to picking me!! my fave product has got to be the hat! love the pink edge + navy monogrammed. The monogrammed scarves are also fab! am a follower and I like marley lilly on FB! What a great site they are. there is so much to like and love. I love the market basket in the pink and green damask in addition to most everything. Great giveaway! I love the solid market basket! Other than the monogrammed floppy hats, I've always liked their monogrammed scarves! How adorable! I went to their site and love the Large Solid Market Basket! This floppy hat would be great to bring along on my upcoming honeymoon to Hawaii! I'm very fair skinned and loved monograms.. must have! Absolutely no lie -- my favorite product on that site is this exact hat -- it is beautiful! I don't usually enter blog giveaways unless it's something REALLY great -- and this is REALLY great and really beautiful! Thanks for hosting this! I absolutely LOVE everything on the ML site. If I had to pick a favorite, I would say the Rope Sterling Silver engraved ring. I really love the hat too! So stylish! I love the monogrammed scarfs on Marley Lilly! Thanks for introducing me to Marley Lilly! Now a fan on FB! I like marley lilly on facebook! Wow, I JUST blogged about how much I love this hat! I love all Marley Lilly products, but especially the natural brown floppy hat with the monogram. I liked Marley Lilly on Facebook! Oh, and I blogged about it! Cute things! I think I would like the lounge chair cover. Great for summertime with the monogrammed hat! Precious. Love the hat! I would have to say that it is definitely my favorite!! Thanks for introducing me to the site! I love the monogrammed scarves! After you did the giveaway a few months back for the scarf, I bookmarked the site and ordered several for christmas gifts! It was so funny that they were running behind in getting orders filled and I think it was all because of the publicity from your blog! That hat is to die for! And added this to my Friday post! I think the hat is amazing! I also love any of the koozies or towels. They would be the perfect addition to our beach days this summer! um, those hats are WAY too cute. i need one in my life! I love their scarves and this hat is fabulous!!! what a fantastic giveaway! i've actually had my eye on this hat for awhile now! i love it and its definitely my favorite item... except i love the pashmina scarves too! adorable! I'm gonna have to say the hat is my favorite!!! That is adorable, I have got to have one for the summer!!! I love the monogrammed ring they have! But I could use this hat for my Spring Break, coming up!! I also tweeted about this giveaway @mwblakey!! And I'm a new follower! the hat is my favorite too! I LOVE this hat! I was planning on buying one for horses races/the beach anyway so I'd really love the win! 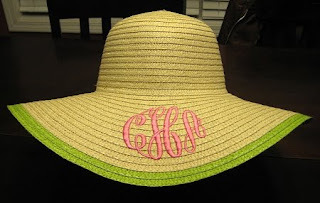 My favorite Marley Lilly product is either this hat or the monogrammed scarves. I like Marley Lilly on facebook too! Oh my gosh!!! It was sooo hard to pic my fav item! I love the Square Engraved Sterling Silver Ring and all the cute koozies! Love these hats! I also love the rings; I'd say they are my favorite. I also like Marley Lilly on Facebook. Please keep up this great blog! My favorite product is probably the hat! Although I like the sterling silver rope ring too. I also liked this on facebook and blogged about it! I absolutely adore the market basket! Too cute. My favorite product is this monogrammed hat! I love the black trim :) I love the monogrammed scarves too! I "liked" Marley Lilly on Facebook! 1. I am in love with the hat and their solo cup koozies! I love everything! But either the scarf or the floppy hat! I love hats! My FB name is oliviadonkit and I like ML already! Everything they have is gorgeous! I need the monogrammed towels for my beach chairs. I need the houndstooth purse with my daughter's red initials. I need almost everything they have. I need to win this hat!! Thanks so much. Thanks for hosting this giveaway! I love that hat so much! My favorite items are the monogrammed market baskets. I like Marley Lilly on facebook. This is so great. I've been looking for a floppy hat for my trip at the end of the month to Cabo San Lucas. Just Fabulous. I love the Floppy Hat as well as the Market Basket. I love this basket for everything from going to the market to having a picnic. Just adorable. I blogged about this great entry. What a fun giveaway! My favorite products are the monogrammed scarves. I commented on the brown monogrammed floppy beach hat. So cute! I Loveee this giveaway! I commented on the hats, and i like Marley Lilly on facebook. Oh my goodness! I just love floppy hats!!! I also love the one with the bow! LOVE the hats! I was looking for one for Easter! I've never heard of this site before but, I'm definitely adding it as a favorite! I'm also going to follow Marley Lilly on Facebook. I love the monogrammed scarves - especially the houndstooth! And I liked Marley Lilly on FB! My fav product is this hat! Since I live in Florida it would be perfect for year around. love the monogrammed scarves and the derby hats! That hat is sooo cute! I would love it to protect my face with it in the summer!!! I love the monogrammed scarves!! But that hat is pretty fabulous too! The Terry Lounge Chair Cover and Bag has to be my fave. I always hate when my towel shifts out of place while lounging and this even has room for my water and ipod. Score!!! I love their market basket, now that i shopping in style. 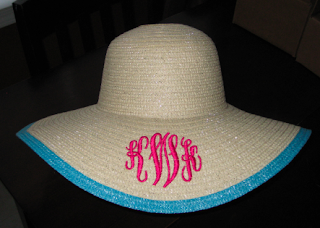 I absolutely love the monogramed floppy beach hats! I've always loved their cashmere feel scarves, but I also love their market basket and the rope monogrammed ring! i'm a new follower, i MUST HAVE this hat!! i'm in love! I was just browsing the Marley Lilly site yesterday! Eyeing the pashmina's, but I'd also love to have the luxury velour lounge chair cover. I love Marley Lilly. I visited their website and I love their monogrammed scarves, especially the multicolor brown and blue blocks!! I like Marley Lilly on facebook!! Love the koozies for summer! OMG I have been wanting one of her hats!!! SOOO CUTE!!! Maybe she can offer a special price to your readers??? can you ask her!? Any who I hope I win, and this is my fav product right now, but I also love her monogram peshminas, the camel color is sooo cute! Also Im a fan on FB! I adore the wine bottle koozies... they're perfect for a picnic in the park! I like Marley Lilly on Facebook now. I love the floppy hats and the personalized sunglasses straps!! I also liked ML on FB and tweeted about the giveaway (@nancemg)!! The floppy hats are definitely my favorite!! Love the hats and scarfs...what a great site! Fingers crossed...going to a horse race in April and this hat would be perfection! Either the floppy hat or the koozies! So cute! I've been searching for the perfect hat for a cruise I'm going on in March! This is it! Thank you for hosting this giveaway! My favorite product is the solid color scarves-- I think a navy blue scarf with a bright pink monogram would be lovely! I do love those hats, though! For a better chance of winning one I've blogged about your giveaway at http://michies-world.blogspot.com/2011/02/marley-lilly.html. Thanks again! Absolutely love the monogrammed scarves and the monogrammed hats! so adorable! Thank you for hosting this fabulous giveaway! I, of course, loooove the floppy hat, but beside that, I really like the oval vertical engraved ring! I also "like" Marley Lilly on Facebook. I loveee the monogrammed rings!!! I love the silver rings! And I already like ML on Facebook. I "liked" Marley Lilly on FB! My favorite is the monogrammed zebra scarf! I love it! The hats are definitely my favorite! Love the pink one! I love the Derby Hats! I love the rope chain ring, I would wear that every day. I like them on facebook! I saw this hat on College Prepster as well and have been wanting to get around to ordering one for Carolina Cup, and my first big alumni event! I'm hosting a Kentucky Derby tea and of course hats will be in the dress code! I reviewed the beautiful scarves got one as a gift! I also tweeted http://twitter.com/#!/MLGilling and I'm a fan on Facebook! this hat is my favorite marley lilly product! Since we have been getting a weekly snow or ice storm (it snowed last night--again. ::sigh::), I have been wearing my lovely monogrammed Marley Lily scarf. So warm and cozy. I am loving the hats as I dream of Spring. I've followed/liked Marley Lily on FB for a while now. Love the Marley Lilly hat! I NEED this for my honeymoon! I also love the monogrammed rings....well actually, I love anything monogrammed! The hat is pretty amazing but I also love the personalized market basket. I could store my child's books and toys in it! The hat is my favorite! I have been looking for something like this for years and would love to take on all my beach vacations!!!! A close second is the scarves. I love having a monogram on it since so many people all have similar ones. Thanks for the wonderful giveaway! I would love to enter! My favorite is the monogrammed coozies. Obsessed! I love the monogrammed croakies and I liked Marley Lilly on Facebook!!!! Thanks for hosting this fab giveaway! this is the perfect hat for the summertime! i like the print market bags, perfect for a picnic. I LOVE this hat!! the koozies would be my close 2nd! I liked Marley Lilly on fb! so first of all, I am a new follower :) yay! love your blog and found it from south carolina girl! my fav is by far this hat but a close second would be the koozies :) you can never have too many of those! I love the Floppy hats and silver rings! I love your blog- and this is great giveaway! I went to the Marley Lilly website. It was so hard to pick a favorite. I love the scarfs, koozies, and personalized sunglasses strap. I think the hat takes the cake as my favorite, though! And liked Marley Lilly on FB. Hi! My favorite product is for sure these sun hats, but I am excited for them to get the monogrammed polos too! I like Marley Lilly on facebook and blogged about this on my tumbler! Thanks so much from one nautical Kate to THE nautical Kate. I love the large print market basket... I'd like one in the pink antique floral print for my baby girl's nursery (only 3.5 months to go!!) I love these hats, though, too! Perfect for wearing in my garden or for a picnic!! i also "liked" marley lilly on fb! I love this hat! Thanks! My favorite product is this wonderful hat! I follow Marley Lilly on Facebook.